Is that look of concentration my focus on the race ahead, geared up from the pumping tunes in my headphones, or just the look of "don't fall off the rollers when everyone is watching"?! But we have to remind ourselves why we do these things we love, and this past weekend definitely did! I love racing, and that's why I do put a lot of time and effort into it, but sometimes you need that little reminder of just how much fun it is to ride a mountain bike. Whether it's a ride with friends, training or a full-on race, it should absolutely be enjoyable. Otherwise, why would we do it? 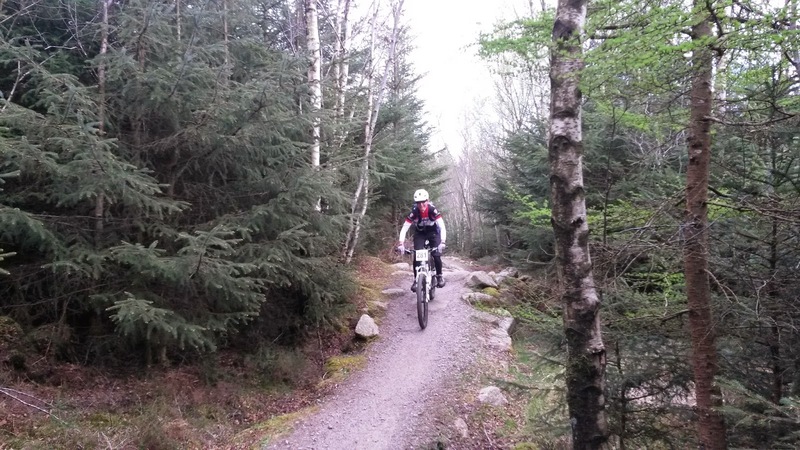 Saturday practice for the SXC Round 2 at Dalbeattie wasn't going too well for me on my 2nd loop round the course . . . I absolutely loved the course. Really nice natural descents, the same tricky technical climb from last year, and a great new section which was tight and twisty. Plus, the SXC listened to our feedback from last year and shortened the course a bit. Despite my love of the course, I made a really stupid mistake and what most of us would class as a comedy fall. Not an actual crash - just a stall on the way over an uphill feature. But when I landed, despite it not being high speed, my saddle caught on a tree root and snapped clean off it's supporting rails at the front. It was completely my own fault, but this, coupled with a few other things that got to me on Saturday, left me thinking I should just go home. I really wasn't in the mood, not enjoying myself and wondering what's the point in being here if it's not fun anymore? Thankfully, I had my wife there with me to snap me out of it and after tweaking a few things on the bike (the Trek Fuel EX9 that Alpine Bikes have been kind enough to loan me while my Superfly gets a replacement frame under warranty), taping up the front of my saddle so that I could still use it, and having a damn good word with myself, I got out for 2 more practice laps. And this time, it felt good. I cleanly rode every section of the track and it put a smile on my face again! I really was pretty close to just going home at one point, not just because of the saddle of course, but a few things that had led to me simply being a grumpy git! I'm so glad I didn't . . .
One other thing that added to my enjoyment of the whole weekend was seeing my wife have a go at this SXC racing game! Heather actually got me into mountain biking in the first place . . . I just became a bit obsessive about it whereas she continued to do it for fun! She entered the taster category and I was so proud to see her race - especially as she overtook a couple of the men in the taster category too! I had to make sure she was also flying the flag for the Alpine Bikes Trek Store Glasgow - team colours! Towards the end of lap 1 . . . having a great time! And across the line after 2 taster laps! I think Heather actually surprised herself with how much she enjoyed it, and having done the Taster category, she's going to give Senior Female a try another time. If you're not sure about giving racing a try, please do check out the Taster category at the SXC races. There's more information on their website, but basically it gives you the chance to do 2 laps under race conditions and at the same time as the Elite/Expert Females and a few other categories, so it's exciting to be out there at the same time. And remember it's not all about lycra and 29er wheels! Heather was riding her Orange Five with flat pedals, 5-10 shoes, baggy shorts and a backpack with her water in it. She really enjoyed it and even if you try it and it doesn't lead to more serious racing, I'm sure you'll enjoy it too! Now, that's what this blog is supposed to be emphasising . . . no matter how seriously you take racing, it's got to be enjoyable. Even if you sometimes take it a bit too seriously like me and get grumpy when things go wrong like on practice day on Saturday! I woke up in a much better mood on the Sunday morning, and both the weather and seeing Heather have loads of fun racing for the first time, lifted my spirits even more. My parents and in-laws were also there to cheer me on, so I couldn't let them down just because I had a few mechanical issues, or just because I wasn't on my usual bike and therefore not climbing quite as well. I lined up in 4th place on the start line feeling calm and relaxed, but focused on the race. My front row 4th place on the grid was mainly due to a few "big names" missing from the usual line-up but I couldn't complain! I realised that 4th place probably wouldn't last long as I had people like Dirt School's Rab Wardell and Andy Barlow chasing us all down from the back of the grid! I was pleased to hold onto that 4th place round the first corner but the likes of Andy and Rab soon squeezed through with their impressive speed. A bit of carnage ensued as we entered the first singletrack section of boardwalk with a tight left hand turn onto it. There had been a bit of wheel bumping on the way to it, but several of us had to grind to a halt with a near pile-up on the entrance to the boardwalk. I managed to hold a trackstand while I waited for the guys in front to get going but I thought it was pretty cheeky of some riders to try to squeeze past us onto the boardwalk when there clearly wasn't enough space! Come on guys, it might be a race, but then there's just common sense and good etiquette! I didn't let this bother me as we soon had a nice open fire road to climb up, along with the first off-piste natural section, a short slight uphill. I was happy to be holding pace and keeping the likes of Scott Logan (last year's Masters series winner) and Wayne Barr (who pipped me in a sprint finish at Cathkin) in my sights. In fact, I kept them within my sights for the whole first lap but then just couldn't maintain the same pace as them. I switched places a couple of times with some other riders, but what I soon realised is that I was just having so much fun! The off-piste sections were great. I loved the technical climb and the descent that followed afterwards (which I believe locals call "Blueberry Hill") was great. I enjoyed picking my way through the new section thereafter, twisty, tight, my handlebars catching the odd tree here and there, making it all the more challenging, but just adding to the fun. There were plenty of spectators around too, cheering us on, and the usual encouragement from the great SXC marshals who we couldn't race without. I mentioned before that I've been really trying to work on my lap time consistency and pacing this season. I used to tail off by about a minute each lap in the last 2 or 3 laps and I'm really pleased with how much it improved at the Plymouth BCXC race last week. One other thing that has helped this week is that I'm now the owner of a Garmin Edge and this GPS device is great for helping with your pacing. It's important to be able to pace based on feel, and that's what worked last week, but this time I was basing it on hard data. Using the auto lap function on the Garmin and having a quick glance at the time and average speed from my last lap compared to the current lap, I could tell if I was pushing hard enough or not. You obviously can't let it distract you but I really do think this Garmin is one of the best things I've bought to help my training or racing. Way better than simply buying better brakes or lighter wheels or whatever! Thanks to the Garmin, and my recent training and own perception of pace, I managed to keep laps 3 to 5 all within 22 seconds of each other, only slowing by about 10 seconds between each. Lap 1 was fastest as always and even my slowing between laps 2 and 3 was only 30 seconds. I can still improve, but it's getting so much better. I now need to work on being really consistent and then faster in the last 2 laps. While I lost time to the 3 riders in front of me, I managed to build a gap behind me and was really happy with my riding. I only made one mistake during the race, on the new twisty section where I got caught out by a feature I cleared on every other lap, but missed it the one time there was a photographer there! Doh! I really was just enjoying myself so much and almost didn't care about the result. I achieved most of my process goals and I felt good. I crossed the line in 9th place (the same as my Cathkin position but in a smaller field) and was happy to not be as far behind some of the other riders as I may have been in the past. A smile when crossing the line - that's what it's all about! I was only about a minute behind Richard Knowles in front of me and while Scott was 4 minutes ahead, there are a lot of factors I can take into account there and I'd say our difference is on a par with last year when he was beating me by similar gaps in the Masters category. With my own bike back (which is 2.5kg lighter than the one I'm on), I'll be quicker up the climbs and I've still got a long way to go in my training this season, so I'm only going to improve. So, I'm taking a lot of positives from that race and I'm continuing to learn with each race having moved up to the Elite/Expert category this season. The main thing I took from this is just how much I enjoyed it. So, from now on, when things get to me, whether they be mechanical or otherwise, I'm not going to let them stop me from enjoying myself! Whether it's racing or just a fun weekend ride with Heather or friends, I absolutely love riding my bike and it's one of the best feelings in the world! If you also race and you find yourself taking it a bit too seriously sometimes, just remind yourself how much you're enjoying it as you crest a difficult climb or zoom down a fast technical descent! It has really helped me remind myself why I do this! 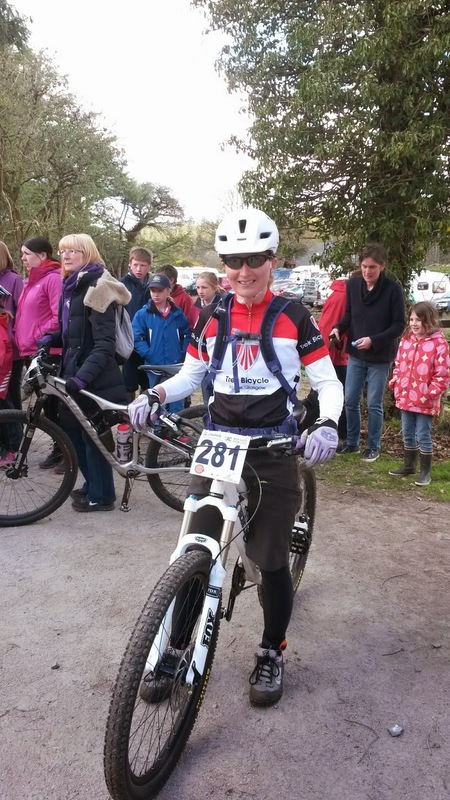 Thanks as always to my wife Heather for her great support, moral encouragement, and feed zone assistance - but in particular well done to her for her first go at racing XC! Thanks to my dad for the photos and to all the parents/in-laws for coming to watch and cheer me on. Thanks finally again to Alpine Bikes Trek Store Glasgow for their amazing support keeping me racing with a loan bike while I'm waiting for mine to have its frame replaced. 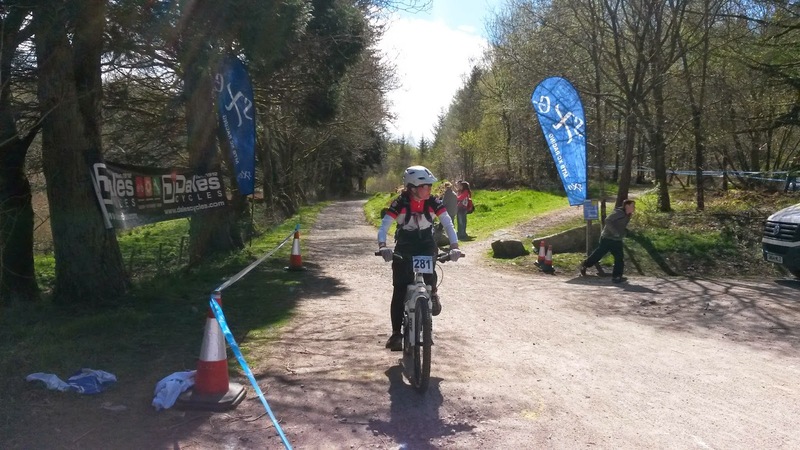 The Fuel EX9 just soaked up the descents on the Dalbeattie course! 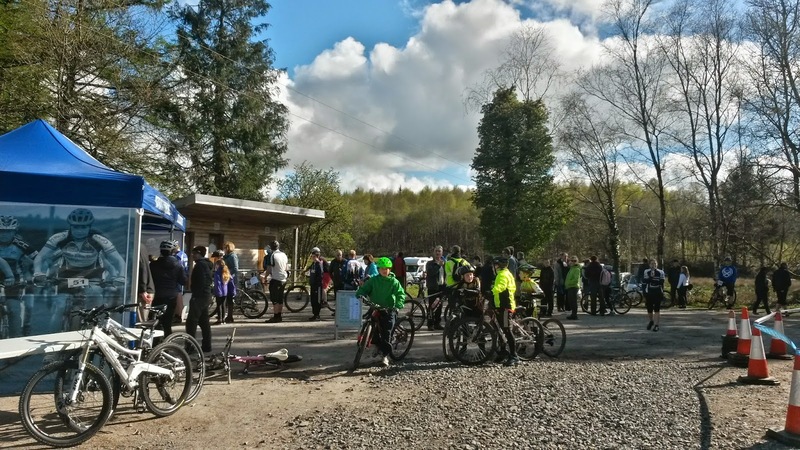 This coming weekend, Saturday 2nd May will see me join the 75km route of the Selkirk MTB Marathon to compete in the British MTB Marathon Championships. This is my 3rd year doing this event, and 2nd in the British Champs at it. I love the course and it's always a great day out. It's not a priority event for me but I'll have fun and aim to improve on last year's time and placing. If you're bored on Saturday and fancy the odd glance at where I am on the course, I'll post a link to my Garmin Live Track on Twitter, so keep an eye on it around 10am when the race starts and you can then view it for the next few hours as we tackle the tough climbs and fun-filled descents of the area from Selkirk to Innerleithen and back (mobile data signal dependent of course!). I'm enjoying a "transition" week in my training plan before Selkirk, riding for fun when I feel like it, rather than when my training plan tells me to! After Selkirk, it'll be back onto full on build training, with more XC races coming up later in May. Now that's a proper mountain bike course!